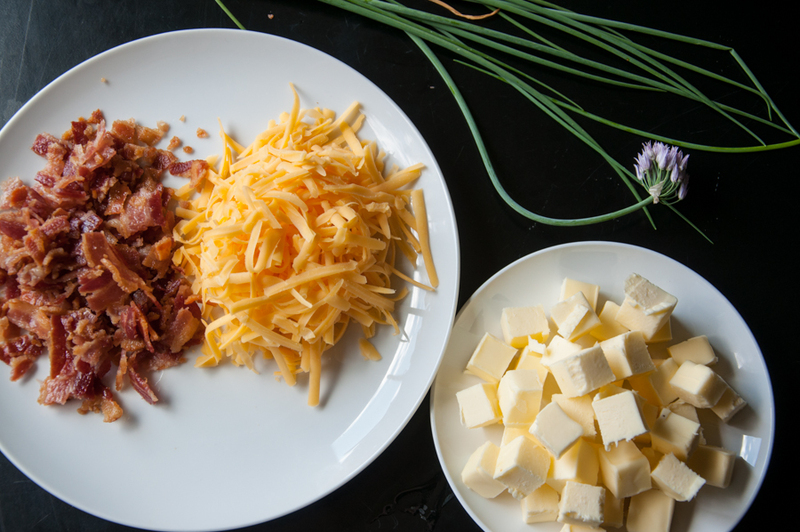 First off, can well all agree that bacon and cheese are two of the best foods on the planet? 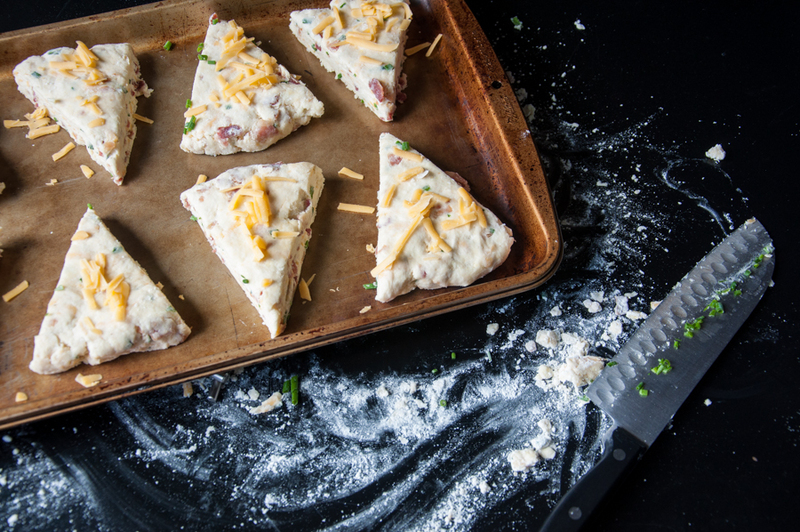 The hardest part about making these scones is not eating all the ingredients before adding them! I have a little garden outback- that’s not a ‘I am being modest sorta little’ but actually a very honest and literal assessment. I had big dreams of my garden being more then what it is but nevertheless it’s better than it was last year and hope it to be even better next year! To give you an example, it’s sort of widely known that zucchini is a fool-proof crop, right? Out of three plants last year I got one squash and with 5 plants this year I have yet to harvest any; green thumb I have not. I did however receive a huge chive start (like a foot in diameter which I kept half of and gifted the other half away) from my mother and decided it was time to use some of it. 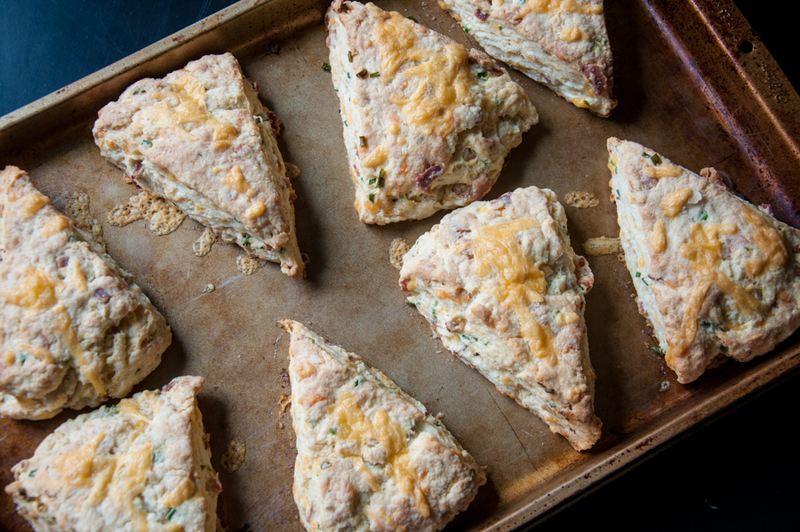 A couple years ago I developed a basic scone recipe (see the adapted note in the recipe index) that I can pretty much turn into any savory or sweet flavor by switching out and adding a couple ingredients, I find baking to be so much fun for this reason! 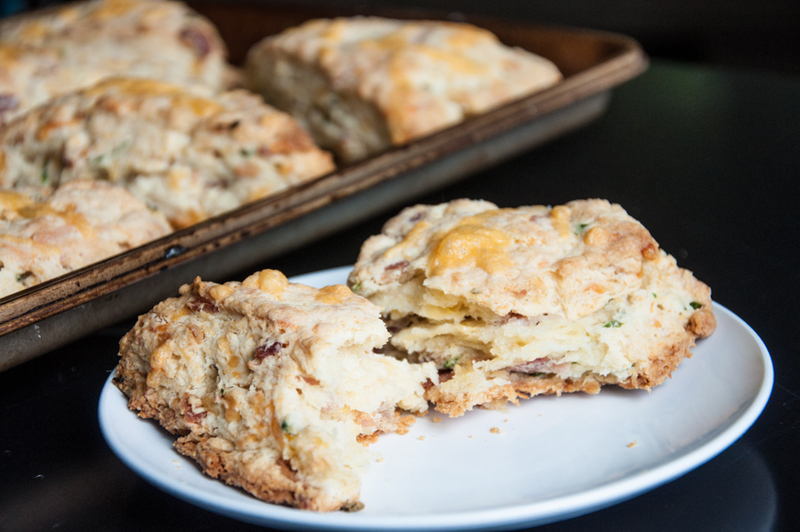 On this day I turned my Cranberry Scone recipe into a Cheddar, Bacon and Chive Scone recipe and can I just say that I happened to bake without doubt the most delicious thing I’ve ever baked in my entire life! Why yes, yes I did. As a baker you are your toughest critic so believe me when I say, I do not use my previous statement loosely. Guys, I even called my husband at work to gush about my mind blowing experience of eating one of these scones straight out of the oven and basically told him he should drop everything he was doing and come home, STAT! Scones for one reason or another come off as intimidating but I’m here to tell you, you can do it! The hardest part about making scones is cutting in all the butter (so much heavenly butter) so do yourself a favor and purchase a pastry blender. Also, as temping as it may be to use pre-made bacon bits, that’s going to be at the sacrifice of a lot of flavor. 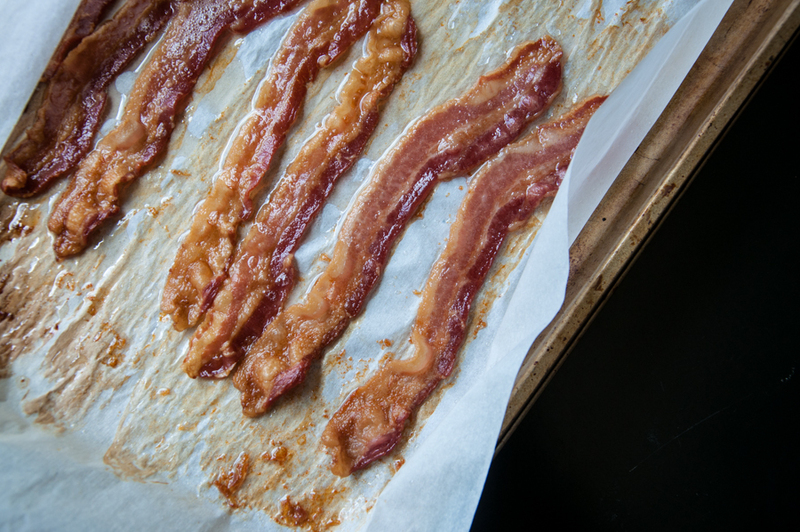 If you’re like me and don’t care for frying bacon I suggest baking it in the oven: line a cookie sheet with parchment paper (making sure it comes up the sides so none of the oil rolls off onto the sheet), place strips of bacon down without having them touch then bake at 400° for about 15 minutes. Preheat oven to 425° In a large bowl, combine the four, baking powder, baking soda and salt; cut in the butter until the mixture resembles coarse crumbs. 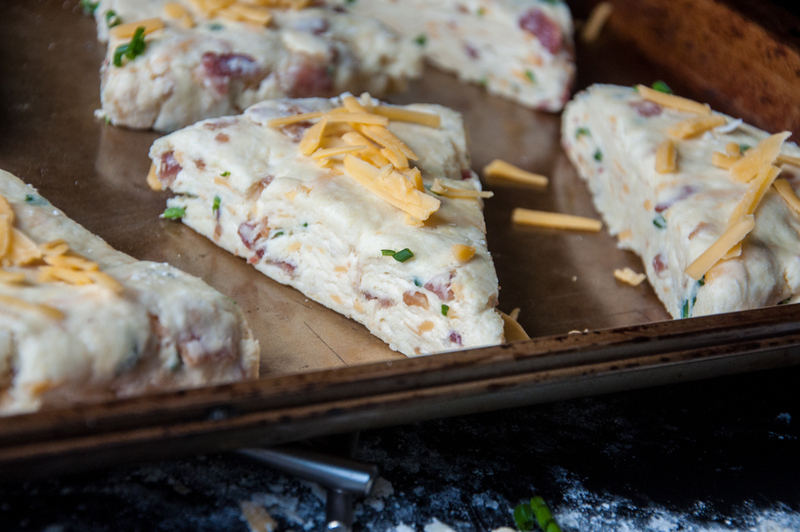 Stir in the egg, sour cream, bacon, cheese, and chives just until combined. Turn onto a flour surface; knead 6-8 times. Roll into a 9-in circle; cut into eight wedges. Place on an ungreased baking sheet. Sprinkle remaining cheese on top. Bake for 15 minutes at 425° then reduce oven temperature to 350° and bake for 10 more minutes. Best right out of the oven; serve warm. 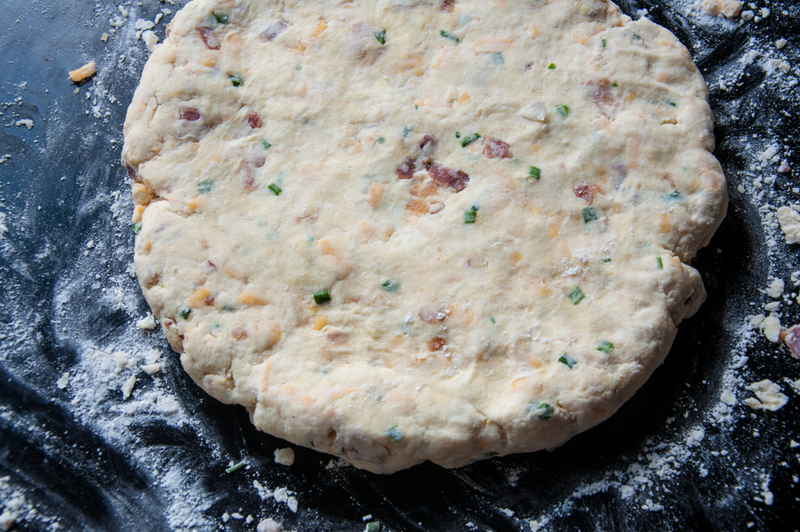 Before kneading, the mixture will be very crumbly, the kneading will bring all the ingredients together. Prep time does not include cooking the bacon. For the record, my husband didn’t leave work early just to eat a scone. They were still wonderful reheated but as you can imagine, nothing compared to straight out of the oven. Enjoy! I think you need to make this and share with your neighbors. You’re so talented, Lena! Lena! I can’t wait until I have an excuse to make these! They look amazing! I’m excited for you to try them! I made your bran muffins the other day, SO GOOD!